When John and I started dating, one of my favorite things about him, besides his ridiculously good taste in music and his honey-brown eyes, was the fact that he could bake muffins. And I’m not talking about a sissy muffin. I’m talking about a whole wheat, fruit packed, tank of a muffin. Now that’s my kind of man. He either knew how to make muffins or researched it and figured it out to impress me. Either way, I think he’s worthy of being a keeper. These muffins are surprisingly simple to throw together, ridiculously moist, full of fall flavor and 100% vegan. Sautéed apples and plenty of pumpkin puree are the star ingredients in this recipe, with oats and brown sugar playing key supporting roles. If I had to pick one food to subsist off of (besides bananas, Braum’s coffee ice cream and peanut butter) it would be oats. It’s nature’s perfect food, I’m convinced. Plus, they look so prit-dee on top of overflowing muffins. This was an experimental recipe but one bite in I knew I’d found a winner. Crazy moist, hints of pumpkin, and little gems of cinnamon-sugar coated apples throughout. These muffins are healthy, perfect for snacking or for breakfast, delightfully portable, and exactly what you need in your kitchen this fall. Agreed? Agreed. These one-bowl pumpkin apple muffins include plenty of pumpkin puree and sautéed cinnamon apples. Plus, they're vegan, ridiculously moist and positively scrumptious. Prepare flax egg in a large bowl and set aside. 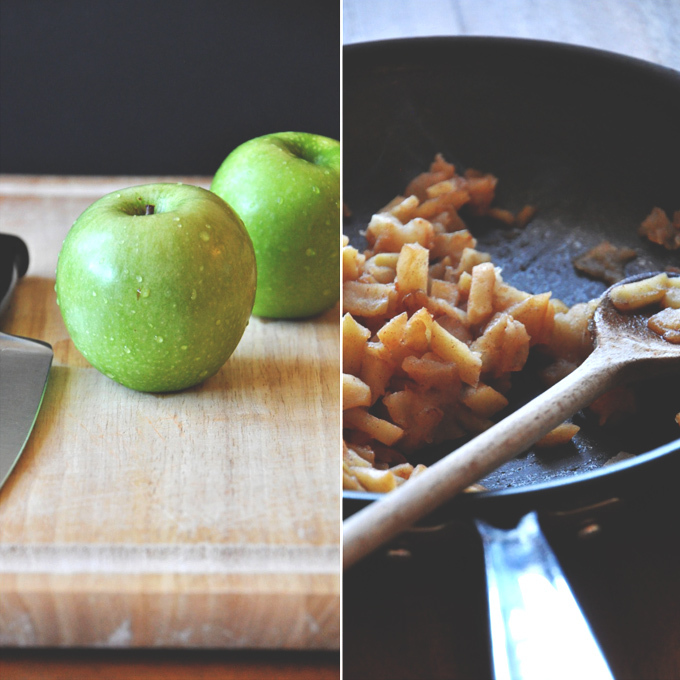 Sauté apples in a skillet with non-dairy butter and a sprinkle of cinnamon until soft. Set aside. Add pumpkin puree, almond milk, brown sugar, oil, and vanilla extract to the flax egg. Carefully place flour, baking powder, baking soda, salt and cinnamon into a sifter and sift over wet ingredients and stir. 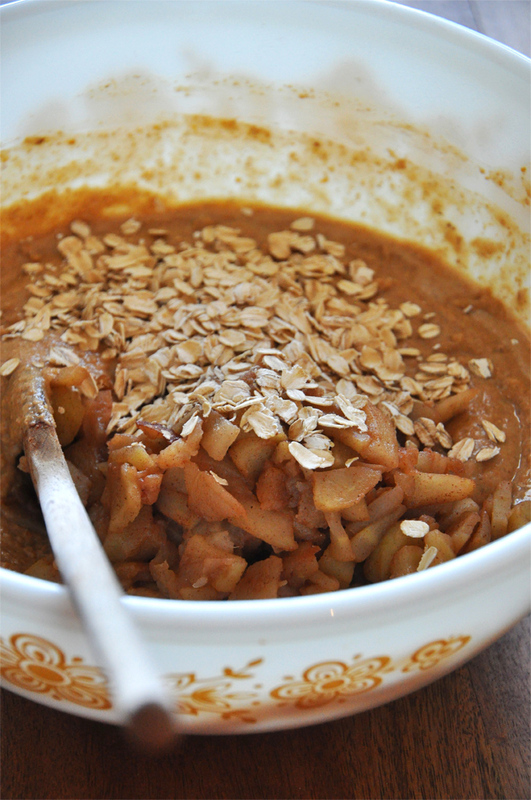 Add apples and oats and stir again lightly until just combined. Spoon into muffin tin until each liner is filled to the very top. Sprinkle oats on top (optional). Bake for 18-22 minutes or until golden brown and a toothpick comes out clean. Cool completely and then store in an air-tight container and refrigerate to ensure freshness. *Depending on the moisture level of your apples/pumpkin puree, if your batter appears to thin, add more flour or oats. Alternatively, if it appears too thick add more almond milk. read the comments and these seem to be a real gem so im looking forward to making them. just one problem in that i dont have any pumpkin puree – could i sub this out for apple sauce? I absolutely love these muffins! My trick for when I find the batter to be a little too runny is to add 1 tbsp of psyllium fiber. It works like a charm. I am wondering what to do to replace the flours for gluten free. Should i do all gf flour or do different kinds ( oat, almond, or coconut instead of whole wheat) or 1 1/2 c of all gf? Thanks! Hi Debi! We have many other GF recipes. Use this one as a guide! Can I freeze the muffins? Can’t wait to try them!! Yes! You can freeze them for up to 1 month! What can I use in place of the brown sugar that is not an artificial sweetener. Thanks!!! Hi, I want to make these for my students but I have one with a nut allergy. Have you made this with another milk alternative? Great recipe and great site! I was looking for a recipe of vegan muffins for breakfast tomorrow with my grandson. I was in the process of making the apple muffins (for which I used one pear that needed to be eaten and 2 apples that were slightly “off”), when I discovered that I didn’t have any oats left in the house. So I used corn flour. In the Netherlands we don’t have any canned pumpkin puree, so I made some a few weeks ago and stored it in the freezer. That came in handy. I have a just made a first batch of 12 small muffins, which are now cooling on the counter top. The 2nd batch of 5 is now in the oven. I can’t wait to taste them! They came out quite nicely, well risen, but not very golden brown. Rather pale, actually… I have a silicone muffin “pan”, which makes 12 small muffins at a time. Just got the first one out of the “tin”. Still warm, but really delicious! I so hope my grandson likes them tomorrow morning. Thank you so much! Here I am again. My grandson didn’t like the taste (I forgot to mention that I forgot to add salt to the batter), but I gave some to my daughter today and she loves them! I am sooo pleased! This is actually a great recipe to vary with. Thanks again for this recipe! Thanks for sharing your changes, Lia! Glad you liked them! This is a bad recipe, very disappointed, and the very first MB recipe that did not work for me. I ended up cooking mine for 50 minutes and the fork was still coming out with crumbs. I decided nearly an hour was enough and hoped they’d firm up as they cooled. They did not. Still raw on the inside and whatever parts were cooked stuck to the muffin wrapper. Wish I could get my grocery money and time back. Still love you MB. Okay, I haven’t made these yet, but I’m about to right now. I just had to write to say that we have recently transitioned to a vegan lifestyle/diet so I have been looking up more and more recipes lately and I have to tell you that I get so excited when your site comes up in one of my searches because I think everything I’ve made from here has been fantastic. Now, I’m off to make some delicious pumpkin apple muffins :) the only change I’m going to make is using apples from our tree rather than granny smith. Hopefully it won’t mess up too much! Made these tonight, they are delicious! Next time I’d add more cinnamon. Thanks for the recipe, unfortuanately they turned out rather flat (didn’t rise a lot) and un-exciting in terms of flavour and overall texture. Just wanted to share my honest actual experience. I have made many of your recipes and got my daughter into your site too. Love it! Omg. I am obsessed with these! Just made a batch and had one for dessert. Can’t wait for the morning so I can have another for breakfast. I made a couple substituions which worked very well: coconut oil instead of canola and 2 tbsp arrowroot flour instead of the flax egg. Ended up baking for 25 minutes (that’s when my toothpick came out clean). These are fantastic! 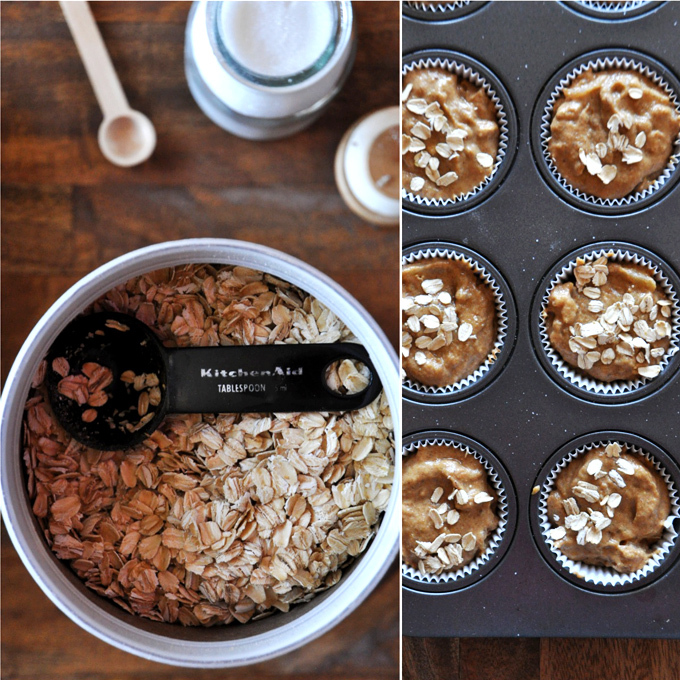 I substituted 1 cup buckwheat flour and 1/2 cup oat flour and reduced the amount of brown sugar to 1/3 cup unpacked. They turned out perfectly and are my new fall favorite! I did make substitutions: pink lady apples, coconut oil, skim cow’s milk, and a conventional egg. That said, I do feel that this recipe needs a bit more oomph. Maybe pumpkin pie spice? Apple juice? I don’t know. I wouldn’t add apple juice because that will affect the consistency of the batter, but try more spices or sweetener! I love your recipes- My family is vegan, gluten free and dairy free so I usually modify to fit our dietary needs. So I am happy to share what is working because these are great! I mix as you suggest in your directions. I cook for 25 minutes and not soggy- perfect. Hi! The recipe looks amazing, but how can I make these gluten free? I have many other GF recipes. Use this one as a guide! Dana, I’m absolutely in love with your mixing bowl (and the recipe of course, which I intend to make this week)! Is it a vintage Pyrex/Corningware as well? I have one in green with white flowers and it just makes me flat out happy to bake with it, would love to add to my collection, and am curious if you, like me, were gifted with one from a family member who loved it for many years, or if you found one at a garage sale/vintage store or something. Love the blog – thanks!! It is vintage pyrex! And it was a gift from my aunt + uncle, which I believe they got on Ebay. Sadly though I broke two of them recently, so I got a new set from Crate and Barrel (plastic). Sugar is sugar is sugar, regardless of what form it comes in. I agree with limiting the amount, but I would increase the cinnamon a little and decrease the amount of sugar rather than using a different form of sugar. Regardless of whether it is honey or brown sugar or maple syrup, it affects our bodies the same way and we should limit it to about 24g (for women) or 32g (for men)/day. That’s 6-8 tsps of added sugar/day. My muffins turned out pretty great! I didn’t have canola oil so I used coconut oil instead. Other than that, I followed the recipe and the muffins are tasty and a good consistency- but they do stick to the muffin wrapper and a lot of product is lost on there. Hi! If you let them cool completely (even til the next day), they don’t stick! This is the first recipe I try since I discovered your site 2 days ago. 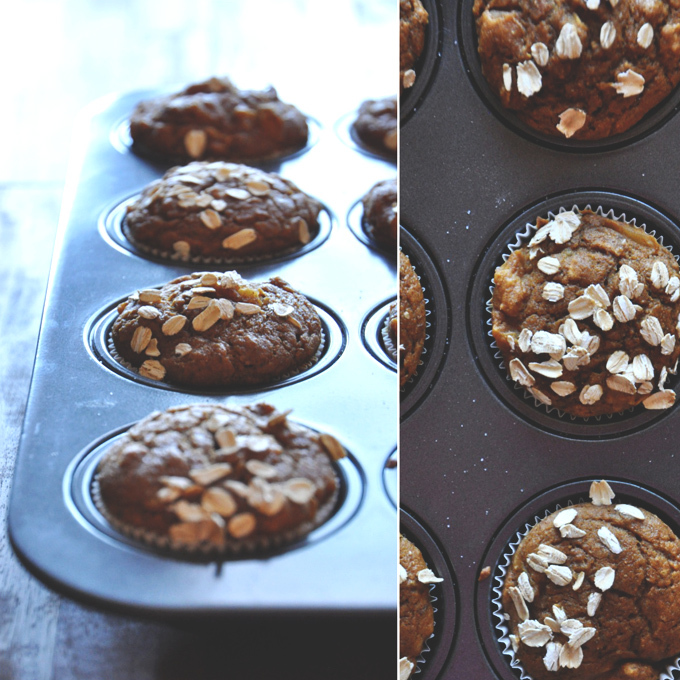 I made these muffins this morning and they are so good!! I’m thinking about cooking an other batch tonight to put in the freezer. It’s kind of exceptional because I don’t often cook the same recipe twice because I love to try new ones! Thanks! Another win from my favourite blogger! My 14 month old helped me make these this afternoon and they were love after first taste! So delicious!!! Didn’t have green apples on hand so I used Macintosh and they were so moist and delicious! 18 minutes was the perfect time. Cannot wait to make these again!!! Was wondering if I could sub the brown sugar for pure maple syrup? I think the flavour would be nice with the pumpkin and a little less refined then the brown sugar. What do you think? Thanks!! Can I use almond flour in place of the whole wheat flour? (New to the world of almond flour but have some in the pantry for my clean eating adventures). Not entirely, but up to half! OMG these look delicious, and just what this 33 weeks pregnant mama is craving! Just one question… What type of almond milk do I use? Sweetened or unsweetened? Thanks! This is my favorite go to website for baking! My two year old has a dairy allergy and loves your vegan black bean brownies! Thank you SO much for posting nutrition facts. Not enough people do this :) I’m making these muffins RIGHT NOW! Can’t wait to try. I just made these this morning and wanted to say how delicious they were! I followed the recipe almost to a T except I sautéed my apples in melted coconut oil instead of butter and substituted melted coconut oil for the canola oil. They were fluffy, moist and I found it frightfully hard to just eat one! The only slight problem was that like another reviewer above, they stuck to the muffin wrappers. I will refrigerate the rest and see if that helps, but I also thought that next time I will try greasing my muffin tin with some coconut oil and forgo using the paper wrappers. I will definitely make these often! Thanks for always having wonderful, easy, healthful vegan recipes. My top tip is to let them cool completely! As in, hours. The day after, once they’ve been cooled and covered, they peel off with ease! -i used some old mushy gala apples instead of granny smith, because i needed to use them up- i used three small apples and cut off the really mushy bits, and diced the rest. it was probably 1.5 cups total of apple chunks. -i only had trader joes regular (sweetened) almond milk, so i reduced the sugar to around 1/3 cup rather than 1/2. 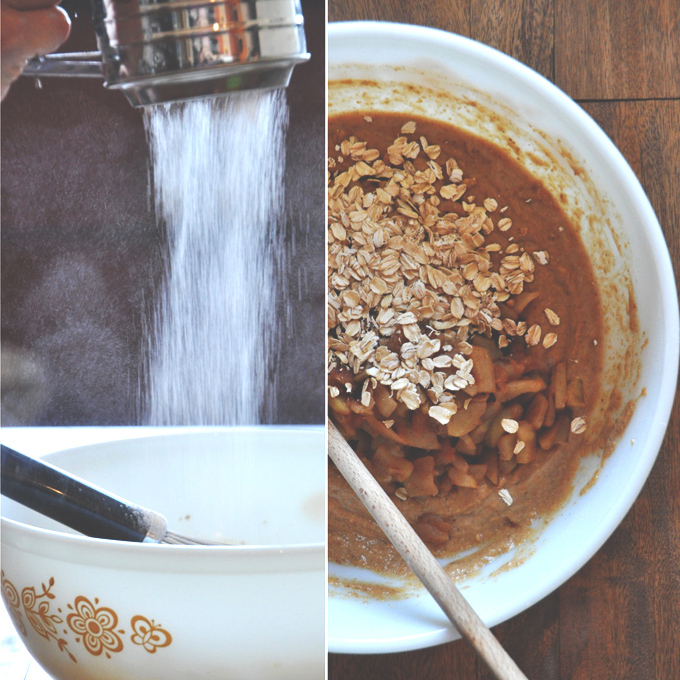 i also used coconut palm sugar instead of brown sugar! overall these turned out wonderfully, i didn’t notice any difference because of the little swaps i made! i put half of them in silicone baking cups and the other half in paper, they popped right out of the silicone but stuck to the paper to the point where half of the muffin was wasted! i was a little sad but i refrigerated them for a day and then they came out of the paper wrapping perfectly! when i serve them to my little brothers, i cut them in half (through the center, so theres a top and a bottom) and toast them (just to warm them up) and put a little pat of butter + a sprinkle of cinnamon sugar on top! they’re definitely best warm. personally, i just stick em in the toaster for a bit and enjoy with a cup of tea! These muffins were great!! I tried to share the link/recipe with the Facebook button but the picture that comes up next to the recipe link is an image of another dish (not the muffins). Is there a way to change that or at least have a more generic pic (e.g. Min baker logo) come up instead? Thanks! I have never written a comment on a web page. I just had to this time. I have used your recipes and find them to be awesome. 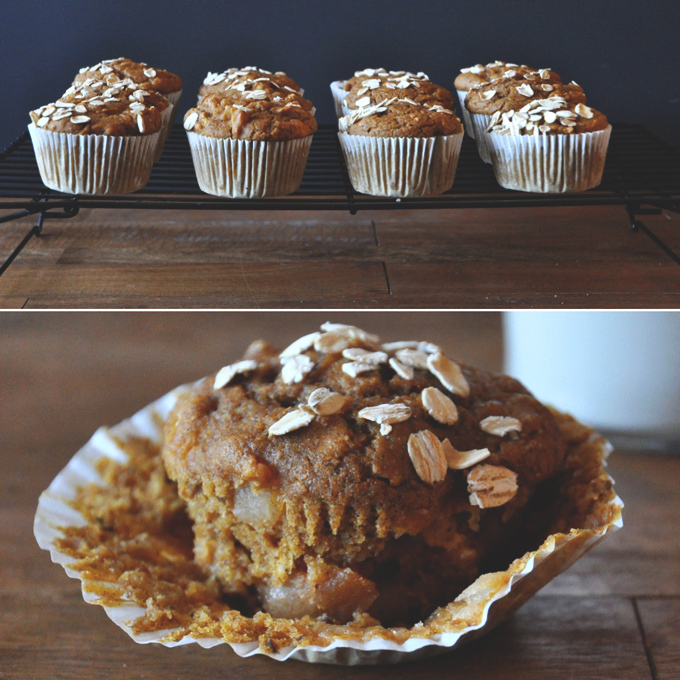 I made the Pumpkin Apple muffins today and they are delicious! I have never come across pumpkin puree in South Africa so cooked my own, kept it quite thick. They came out perfectly! Thank you for your wonderful recipes, makes life so much easier! P.S. Note for Sara – My batter mixture was thick. Didn’t run off spoon when putting into muffin pan. Cooked them for 18 minutes, they rose and kept their shape. These are the BEST Muffins EVER! I made three badges of these already! In Belgium they do not have pumpkin puree’ so I always bake mu pumpkin before and I puree it myself which is delicious! yum I used olive oil instead of canola as I didn’t have any….Used coconut sugar as I have diabetes and it works better for me…and millet flour as I didn’t have any whole wheat flour….so you may think I did a different recipe but NO! ah ah I looooove these!!!!! Thank you so much! I love reading your newsletter and your recipes…. Never stop to amaze us!!! Lovely, thanks Monica! We hear Belgium is beautiful! Thanks for sharing. Can you turn this into a bundt cake?!?! I cheated and made these non vegan, I used real milk and an egg. I also added all the oatmeal I had, about a cup and more cinnamon and instead of white and wheat flower just used wheat (again that’s what I had on hand). They were still great! However, the took a veryyyyy long time to bake. Oh and my hand slipped while doing the oil so I’m not quite sure how much ended up in there. Hello, I just whipped up a batch of batter, about to put in the oats, but I have none! Do you think I should add a little extra flour? Or is there some other option? Thanks so much- I can’t wait to try them! Sorry for the delayed reply! I’d say adding a little more flour or some almond meal would’ve worked fine. Hope that helped! Firstly I want to say that I love your site and I’ve really enjoyed your recipes, especially the black bean brownies an easy vegan cheesecakes. I totally appreciate you sharing all this wonderful hard-earned knowledge with others and I hope you get as much out of it as we do! But…..
….My muffins turned out super mushy, I’m so disappointed (sniff). They rose beautifully but immediately collapsed on leaving the oven (even though I baked them an extra 6 mins) and they are basically just runny goo inside. This happened before when I tried to make pumpkin muffins using another recipe, I really hoped it would be different this time! I can’t find canned pumpkin here in Germany, so I steamed and mashed a Hokkaido. I followed all the quantities given to the letter. I guess my batter must have been too runny, but there was no description in the recipe for what sort of consistency the batter was supposed to be, so I had to make a guess. Perhaps if you could describe the consistency the batter should have it would be helpful for people who are trying to figure out whether to add flour or liquid? Hi Sara! I haven’t made this recipe in a while, but I do remember the batter being more scoopable than pourable, if that’s any help. Hold back on the wet ingredients a little next time and that should do the trick! Also, cook for a little bit longer? Hope that helps! You are such a star for getting back to me so fast! Thanks for the advice, I’ll try making them again v soon. Happy Autumn! Of course! Hope it all turns out! Ah, thanks Hannah! So glad you found us. Good luck with the muffins again next time! Thank you so much for this recipe. My son has always been allergic to dairy but now he has an egg allergy that is getting more and more sensitive and even baked goods set it off now. I’ve found baking dairy free to be challenging enough but now vegan baking is even worse. I love baking but find I bake for him much less than I’d like to because it never turns out very good. More than one time I’ve tossed out entire pans of muffins because no one in the house would eat them. This was the first time I’ve made a vegan recipe that I actually love. I gobbled up 3 of them myself before they fully cooled. They actually have the perfect muffin texture and rose! I usually find vegan muffins flat, dry and dense. I even subbed in water for milk because his school lunches must be peanut/tree but free and used vegan becel in place of the canola oil and it was just delicious. Thank you so much! Had lots if fun making these with my 2yo son today. Used cooked mashed butternut and coconut oil instead of butter. Very yummy but they all stick to the patty papers! Half the muffin gets left behind in the paper and they are very hard to eat. Any tips? Just made these muffins for breakfast, they were excellent! Thanks for the great recipe. Hello there! My husband has some friends over tonight for a little nerd time – while they game, I bake! 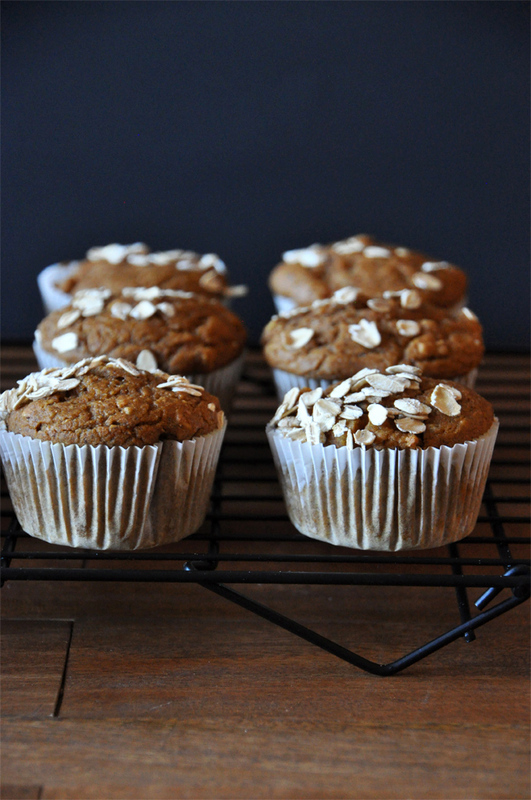 And my absolute favorite things to bake are muffins – of any kind! They are just little pods of goodness, no matter what. These particular muffins just came out of my oven – from the dining room I heard the words “Hey, what are you baking in there?” “Muffins,” I replied. And they called, “They smell great!” Then suddenly, a half-dozen muffins were missing from my kitchen. I added some extra oats and cinnamon and used a mixture of pumpkin, banana, and applesauce rather than just pumpkin to use up some fruity-goodness that had been hanging around my kitchen. I also took the liberty of using raw apples, rather than sautéing them, as my momma would do in our childhood cakes. By all those powers combined, a beautiful, moist, and fluffy muffin was born! Thank you for helping our home smell like heaven and fueling my muffin-fetish! These are absolutely delicious! I substituted the flours for Bob’s Red Mill gluten free all purpose baking flour and BRM’s gluten free oat flour and added a half teaspoon of xanthum. I also baked them at 350 for about 35-40 minutes. The knife wasn’t totally clean when I pulled them out, but almost. And they are delicious!!! Thank you for the recipe! These look delicious! Can I substitute commercial egg replacer for the “flax egg”? And any way to reduce the sugar content without sacrificing the flavor? I think an egg replacer would work just fine here. As for the sugar, what about subbing half of it for honey, or reducing it by half and adding a bit of stevia to taste? Just taste the batter before you bake them so you have an idea of how sweet they’ll be. Hope that helps! Can I sub virgin coconut oil for the butter? I try to eat all non-processed/unrefined foods whenever possible, so I don’t have vegan butter. Yes, it will likely affect the flavor but the texture should be fine! Actually, I cook with coconut oil a LOT, and it really doesn’t affect the flavor. I use spectrum (I think). I first bought trader joe’s brand and it definitely gave everything a hint of coconut. But this stuff absolutely doesn’t. Just wanted to let you know in case you ever consider using it! ;-) (or maybe you already do and my tastebuds aren’t sensitive enough?) Thanks for the reply! I just wanted to tell you that i LOVE your website. This is my first time commenting, but I have made a number of your recipes and have loved them all. 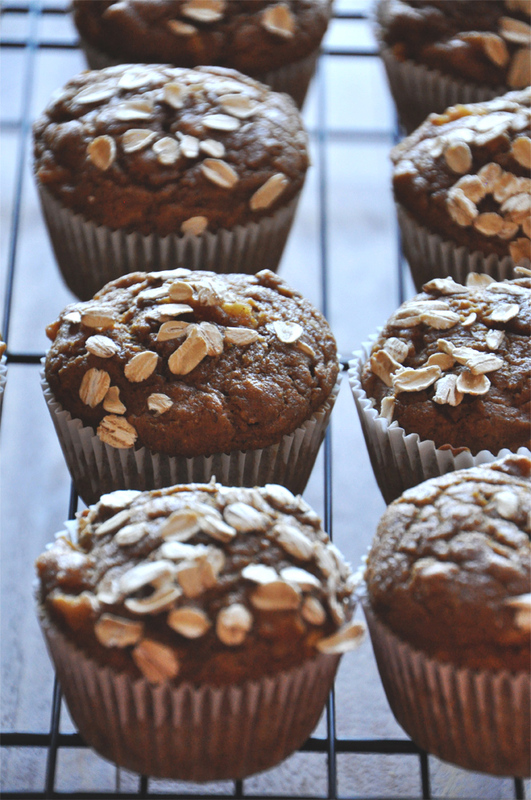 In the spirit of fall, I decided to make these muffins this morning… they are in the oven now and I cant wait til they are ready! Thanks for all of your inspiration and delicious recipes!! I remembered a little too late… AFTER I mixed up the batter for these lovelies… That last weekend I got rid of my poor rusting muffin tin. So! I tossed the batter into an 8×8 pan and left it in the oven a bit longer than the posted bake time and I am very happy to report that I now have a wonderful apple cinnamon muffin-cake that I am trying really hard not to devour right now. I can’t wait to have it again for breakfast! Baked these today with the kids! Oh, sooo good!! I waited the apples to be soft so no problems with the hard apple chunks so don’t leave that out because they add tons of flavor!! For sure baking these again! Thank you for the recipe!! These came out perfect. Wonderful tasty and great texture. Doubled recipe and froze half the muffins. Delish! The hubs made these this morning and the littles gobbled them up. He did make a couple changes, used all whole wheat pastery flour and instead of apples and vegan butter (didn’t have any on hand) added a cup of applesauce. They were a little gooey, probably a bit too much applesauce;), but oh, still so yummy! Best part, they came up on myfitnesspal!!! Thank you so much!!! How did that turn out and what flour(s) did you use? Just made these and they’re great! I added ground hemp hearts for extra protein. I made this recipe with the updated 1.5 cups flour. I had 3/4 cup canned pumkin puree left from making pumkin pancakes this morning and I wanted to use it up. I also had some left over homemade applesauce that I wanted to use up in case it went bad. Using 3/4 cup canned pumpkin puree, 1 egg (no flax in the house), 1 cup coconut milk (not in the can), and 1/2 cup chunky homemade applesauce- I got a perfect muffin and consistency. It yielded exactly 12 muffins lined to the top using a 1/4 measure scoop. Hope this helps for those who want to use jarred or canned ingredients! My kids would never eat these with apple chunks so I took that out, upped the pumpkin to 1 full cup and baked them 5-8 minutes longer. They were yummy! Quite delicious, but I too had mushy muffins. Could it be the amount of flour? Did you intend to write 1 1/2 cups instead of 1/2 cup? I had the same experience as Jeff above. My muffins turned out mushy and even cooking them for longer, they never quite became muffins, the bread pudding analogy is a good description. 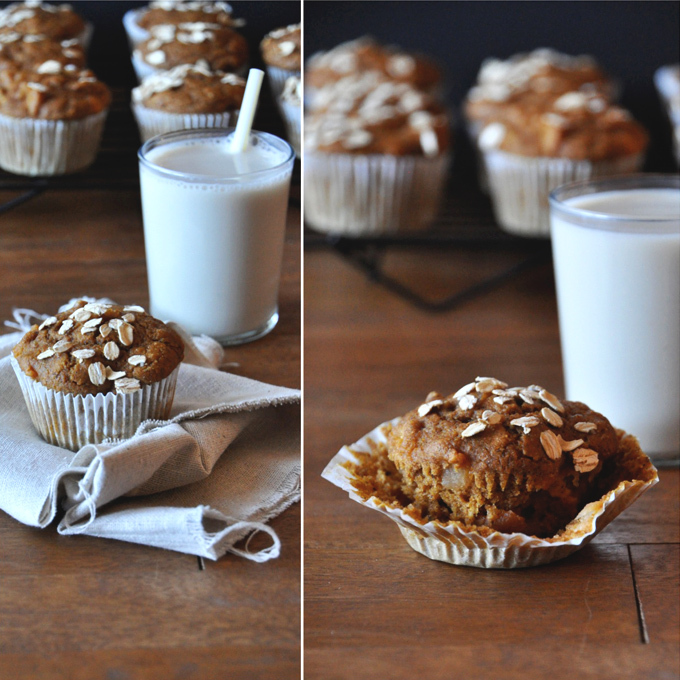 I used rice milk in the place of almond milk in order to make the muffins suitable for someone with a nut allergy, could this have made the difference? Thanks. Hmm, this is bizarre! Mine came out super moist and delicious and so have several other people’s I’ve heard from. If your batter appeared too runny for some reason I’d recommend adding a bit more flour or oats. Hope that helps! LOL! I guess that’s what happens when you do your recipe searches at 1am! :) Sorry about that! And thanks for setting me straight! Just wanted to check- since there’s no sugar in the recipe, is this assuming that we use sweetened almond milk? I buy the unsweetened and I wanted to make sure I didn’t need to then add some type of light sweetness. Kristen, there’s brown sugar. Sorry I think you must’ve missed it in the ingredients list! Mine were tasty but they came out more like a delicious bread pudding in the rough shape of a muffin. Maybe too much water in my homemade pumpkin puree? Maybe another altitude baking problem for me? Delicious, regardless of texture. Thanks for the recipe! Made and devoured, and recipe shared. I am sure there is one more new follower along with it! Off to make the snickers pancakes and caramel sauce! Men +_Muffins = LOVE, these look incredible – lovely photos too! These look great, but there’s no canned pumpkin puree in this part of the world, can I just cook a pumpkin and mash it instead? Noam, absolutely! It would probably be even better than canned. Thanks for asking! Ooh yeah, I will be making these first chance I get!! Thanks for the PDF! Yum! I’ll be making these this weekend for sure! I want to make just about everything on your site! Hi! Sounds delish! But you mention apple sauce in the instructions, but no apple sauce in the ingredients list! :-) Have a good day! Thanks, Jessica! I just fixed that. 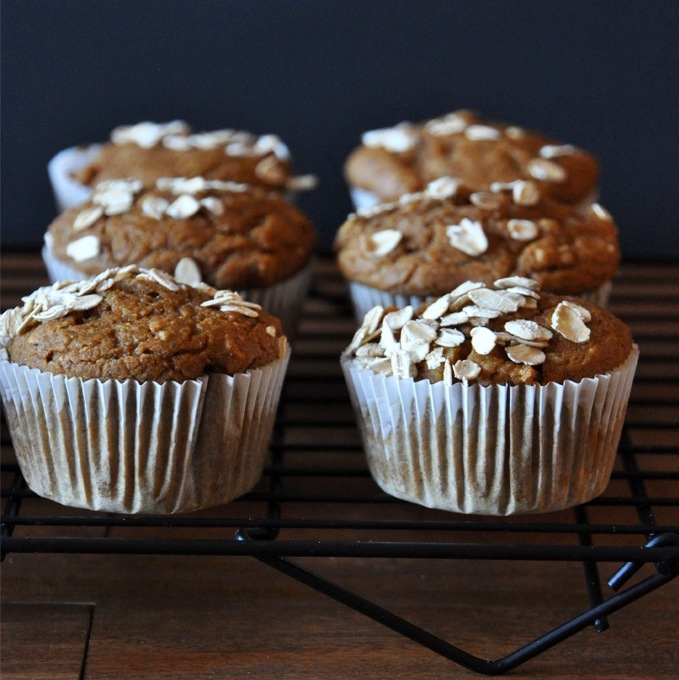 I usually add applesauce to these muffins but this time I used pumpkin puree – just forgot to swap that out! Thanks again!